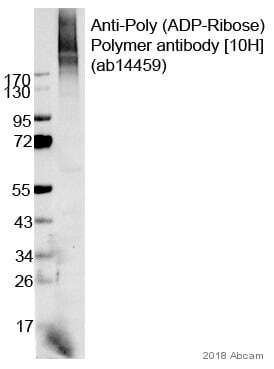 This antibody reacts with poly (ADP-Ribose) Polymer synthesized by a variety of poly(ADP- ribose) polymerases (PARP)-related enzymes including PARP1, 2, 3, tankyrase, vPARP, sPARP and others. The antibody does not cross-react with ADP-ribose, 5'-AMP, or yeast RNA as tested by ELISA. Other Immunogen Type conjugated to bovine serum albumin. Poly (ADP-Ribose) polymer mixed with methylated bovine serum albumin. Rat liver induced for Poly (ADP-Ribose) Polymer synthesis by injection with diethylnitrosamine. MEF's treated with 500um Hydrogen Peroxide. Our Abpromise guarantee covers the use of ab14459 in the following tested applications. WB Use a concentration of 2 - 10 µg/ml. 2 µg/ml, if using ECL or 10 µg/ml, if using colorimetric methods. 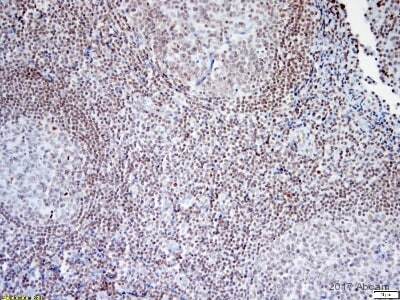 ab18392 - Mouse monoclonal IgG3, is suitable for use as an isotype control with this antibody. Poly (ADP-Ribose) is a polymer synthesized by a class of enzymes named poly(ADP-ribose) polymerases (PARP). Using NAD+ as substrate, PARP catalyzes the formation of the polymer poly (ADP-Ribose), with chain lengths ranging from 2 to 300 residues, containing approximately 2% branching in the chain. Poly (ADP-Ribose) polymer becomes attached to nuclear proteins, and to PARP itself (automodification). Under normal conditions, cells display low basal level of poly (ADP-Ribose) polymer, which can dramatically increase in cells exposed to DNA damaging agents (irradiation, alkylation, etc.). This increase of polymer synthesis is usually transient and is followed by a rapid degradation phase with a short half life which can be less than 1 min. The low endogenous level of polymer in unstimulated cells and its rapid catabolism during DNA damage has been ascribed to high activity of the polymer catabolizing enzyme poly(ADP-ribose) glycohydrolyase (PARG). Western blot - Anti-Poly (ADP-Ribose) Polymer antibody [10H] (ab14459)Image courtesy of Dr Aashish Joshi by Abreview. Immunohistochemistry of rat livers treated with diethylnitrosamine (200 mg/kg) and stained with ab14459 diluted 1/100. After treatment livers were removed and rapidly processed 10 hr later, at peak polymer induction. Left hand side image was from diethylnitrosamine untreated liver tissue and right one represents DEN treated sections. ab14459 staining Poly (ADP-Ribose) Polymer in Rat cardiomyoblast (H9c2) by Flow Cytometry. Cells were fixed with formaldehyde and permeabilized with 0.1% Triton X-100. The sample was incubated with the primary antibody (1/1000 in 3% BSA) for 1 hour at 37°C. 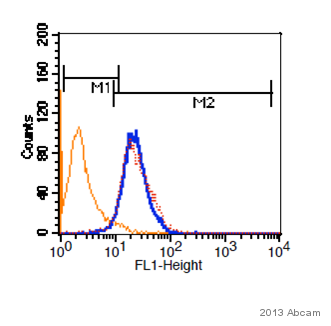 ab98707, FITC-conjugated Goat anti-mouse FITC (IgG3 heavy chain preadsorbed 1/1000) was used as the secondary antibody. Immunocytochemistry/ Immunofluorescence - Anti-Poly (ADP-Ribose) Polymer antibody [10H] (ab14459)Image courtesy of Dr Manikandan Periyasamy by Abreview. ab14459 staining Poly (ADP-Ribose) Polymer in human breast cancer cells (MCF7 cells) by Immunocytochemistry/ Immunofluorescence. The cells were paraformaldehyde fixed, permeabilised in 0.2% Triton/ PBS and then blocked using 1% BSA and 3% FBS in PBS for 30 minutes at room temperature. Samples were then incubated with primary antibody at 1/50 for 1 hour. The secondary antibody used was a goat anti-mouse IgG conjugated to Alexa Fluor® 555 (red) used at a 1/500 dilution. thanks for your quick reply. I would like to test the two antibodies ab14459 and ab14460 in IP experiments. It would be great if you could send me the discount codes. Thank you for your message. I am very pleased to hear you would like to accept our offer and test ab14459 and ab14460 in IP. Each code will give you: 1 free primary antibody before the expiration date. To redeem this offer, please submit an Abreview for ab14459 and ab14460 in IP and include the corresponding code in the “Additional Comments” section so we know the Abreview is for this promotion. Please remember that submission of the Abreview is sufficient for the discount code to become active. Any feedback that you can provide will be greatly appreciated, whether positive or negative. If you have any further questions, please do not hesitate to contact us. We look forward to receiving your Abreviews and wish you luck with your research. at the EMBO conference 2012 in Nice I learned about your offer of "100% testing discount". I would like to test your anti-PADPR antibodies (ab14459 and ab14460) for Western Blotting and immuno precipitation experiments (human). Do you need further information? Thank you for your message. i hope you enjoyed the EMBO conference. I am sorry to confirm that to our knowledge, ab14459 and ab14460 have not been tested in IP. They have been tested in western blotting. Therefore, I can offer a discount off a future purchase if you buy ab14459 and ab14460 now, testthem in IP and submit feedback to us in the form of an Abreview. It doesn't matter whether the Abreview is positive or negative, we would just really like to receive your feedback. You would recieve one discount code for each antibody. Eachdiscount codewould be to the value of: 1 free primary antibody. 1. Reply to this e-mail to let me know that you would like to proceed and test ab14459 and ab14460 in IP. I will then send a discount code. This code must be issued before purchasingthe antibodiesso please wait for my reply before ordering. 2. Purchase ab14459 and ab14460 either by phone, fax, or online (https://www.abcam.com). This purchase will be at full price. 3. Test the antibodiesin IP. 5. After the review is submitted to us, the discount code becomes active. Simply place your new order by phone, fax, or on the web and mention the discount code.Each discount codecan be redeemed for any primary antibody ordered and the discount code is valid for 4 months after issue. We are always pleased to obtain feedback about our products and any information is greatly appreciated! Even if ab14459or ab14460 turns out to be unsuitable for IP, you will still receive the discount on your next purchase after your Abreview has been submitted. I am sorry this product did not perform as stated on the datasheet and for the inconvenience this has caused. As requested, I have issued a free of charge replacement for one vial of ab14459.